Andrew Brayshaw has been to hell and back. 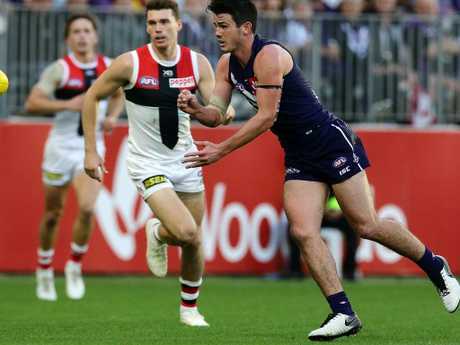 Three games into the season and Fremantle Dockers youngster Andy Brayshaw has already kicked some massive goals just by stepping onto the field. And, heading into the first of two Western Derby's for 2019, there are still some big goals to kick. The No. 2 draft pick from 2017, Brayshaw played 17 games in his debut season, he earned a reputation as a midfielder who went hard at the ball. He led the team in tackles per game with 4.4 until the fateful moment in the round 20 Western Derby. It was a moment that caught the interest of the nation as Brayshaw's rookie season was cut short from an errant punch from West Coast's Andrew Gaff. The punch saw Gaff suspended for eight weeks and ultimately missing out on playing in his side's premiership victory, while for Brayshaw, the scars have carried on much longer. A broken jaw healed in a month. His three teeth that were knocked out have taken a lot longer. But the deepest scar wasn't physical as the now 19-year-old started the painstaking return to the field of play. While Brayshaw and Gaff met during a pre-season JLT Cup clash in March, the youngster said the biggest test was returning during the regular season. 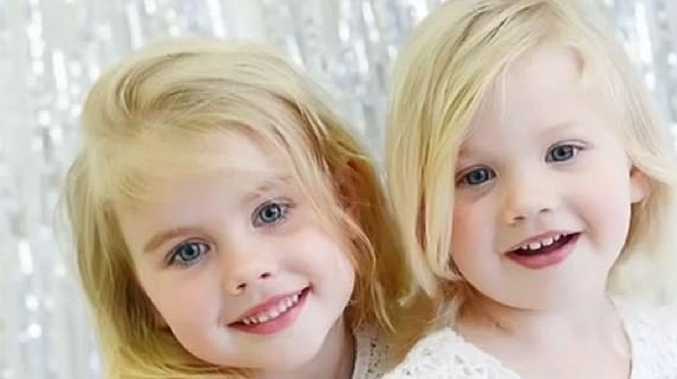 "It's a match that's been pencilled into my calendar for a very long time now and it is one of the milestones for my recovery," Brayshaw told news.com.au. "Rehab has been a very long process especially mentally. Ending my first season on such an interesting note, it makes it pretty hard to imagine coming back out really confident so there's been a lot of mental things I've had to get through. "The club has been really supportive, I've been doing plenty of work with team psychologists and the players have been getting around me. It's just checkmarks that have been playing out along the process. The JLT was a big thing but even going back to training competitively last November was a big deal. 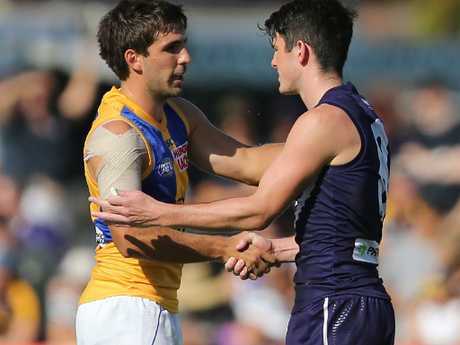 Andrew Gaff of the Eagles and Andrew Brayshaw shook hands before the first bounce. "It's been pretty long, but I would consider playing that first JLT and then definitely AFL round one, I'd say that was my recovery time so I'd say I'm back to 100 per cent." As for the secret to get through his rehab, Brayshaw said his support network - particularly his mum and girlfriend - were keys to getting him back out on the field. 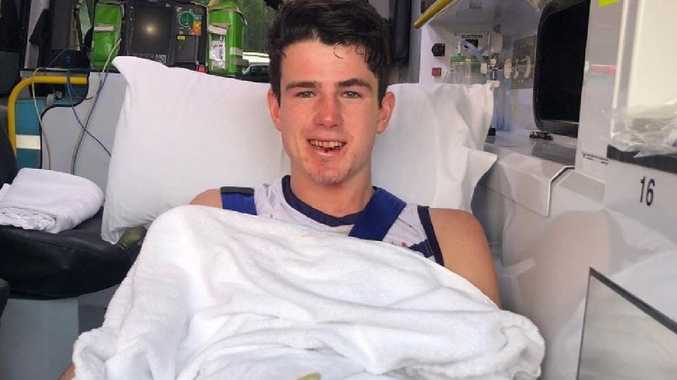 But coming from a sporting family as one of three brothers playing in the AFL alongside Melbourne Demons star Angus and West Coast's Hamish, he admitted his brothers were helpful in his recovery. He also praised his father Mark, a former AFL player for North Melbourne, who helped put his situation in perspective. "My dad came out and said although he felt sorry for me and he cared about how I was going, he also said to spare a thought for Andrew, which I thought was a really nice thing to say," Andy said. After the less than ideal finish to the year, Brayshaw also farewelled close friend and former housemate Lachie Neale in the off-season. Neale, 25, moved to the now high-flying Brisbane Lions, a move Brayshaw said tough after the pair developed such a strong relationship on and off the field. "Having Lachie last year as a housemate, he was really more of a mentor and also a bit of a brother," Brayshaw said. "I had a really close relationship with him, not only just at the footy club but also got on well outside the club, played golf together, obviously lived together and just got along really well. "I was so happy we were able to form that relationship last year so much so that I was invited to his wedding at the end of last year. Then I heard after the marriage they were going to move to Brisbane and Lachie had been offered a deal. "It hurt given we'd formed a strong connection and we also worked so well in the midfield but at the end of the day, he was starting a family and a new life so I wish him all the best. "We're still really good mates and keep in touch but it's definitely hurt the club having such a gun two-time Doig Medallist (Fremantle club best and fairest award) leave but in that same breath, it also opens an opportunity for other younger midfielders to come up and play a bit of a role." And there's no better time than this week for a younger player to put their hand up with Dockers skipper Nat Fyfe sidelined with concussion following a head clash with St Kilda's Josh Battle last week. The 2019 AFL season will be live and on demand on Kayo Sports for just $25 per month for two devices at once on Apple, Android and Telstra TV, for Apple and Google Android smartphones, on web browsers and via Google Chromecast Ultra devices. Click here for your free trial. There’s no stopping this kid. The Dockers are rank outsiders for the derby clash despite the sides both sitting on two wins and loss to start the season. Fremantle will also have to snap a seven-game losing streak in the derby dating back to 2015. "The derby's, you obviously get bragging rights but then I think it means a little bit more for us now that Nathan, our captain, is gone so other players have to step up and take on bigger roles," he said. "So if we could really have that good connection between our big four at the back then we should have a really good crack this weekend. If everyone steps up and plays their role, hopefully we can get it done. "It's always a tight contest, it's always a very hard game, it's almost like a final sort of game. There's definitely a lot riding on this one."